Second floor villa with screened porch and full ocean views. 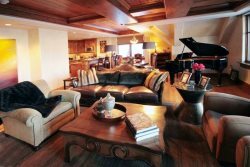 This villa offers two TV's and a CD player for guest use, along with plug-in access to high speed internet. Guests also enjoy hardwood floors in the kitchen. Free access to the community pool. Square Feet 800. Bedding includes a King bed in the master suite, and a sleeper sofa in the living room.